Ahhhhh, the end of a short anime. So much happens, in so many ways and meanings, both inside and out of the anime. I've taken a long time to get this done, despite having been keeping up with this anime episode to episode, because quantifying my opinion has never been something I'm comfortable with. Then, after enjoying a re-upload of Arkada's 'Glass Reflection' review series, I suddenly felt stupid for not thinking of this sooner. I simply won't quantify my opinion. This does mean that my End posts that I do will be formatted in a manner very similar to Arkadas. Oh well. Dansai Bunri has several flavors of original. That needs to be said, but also note that it fits quite cleanly into the 'Shounen' genre. It's weird, it's unique, but if you're absolutely against ever watching 'Shounen', I doubt there's anything here that will radically change your opinion. For most of the show, the main heroine, Iwai, doesn't get much development past the first 'protect me princess' role she's put in. When she finally gets some, it is actually pretty good, and her personality is very enjoyable at those times. A lot of the time though, it feels like she leans on a bit too much 'Moe' to get by while other characters are getting proper development. I felt rather annoyed that they spent time developing Kiri's friends, but then never used them past giving a plot element dump on him. I think that somewhere along the line, someone on this animes 'Shot caller' management decided they needed to put emphasis on Kiri's hair cutting fetish, which is fine since it helps push the plot, but didn't know how much emphasis was necessary. I lost count of how many times I put my face in my palm at them panting heavily while they do the hair cut or something similar. Come to think of it, Dansai Bunri does its best to push several fetishes into our face, one for each Killing Goods, almost. To its credit, they do push some borders nicely without it feeling like cheap shock appeal. For example, perhaps it's just my status as a hermit, but this was the first time I'd ever seen licking in a mainstream anime. (I don't count harems, they're comedy, and even then, I don't recall any I've seen having it). Despite this, it somehow feels forgettable. Perhaps it's founded in the original story, perhaps it's in how the studio that made the anime decided to do it, but for all its uniqueness Dansai Bunri still feels like it leans a bit too much on its strange central theme and character/weapon. Absolutely to its credit, Dansai Bunri's action scenes are all good. In fact, as I sit here reminiscing up memories to write this End post, other than the last 2-3 episodes, the only remarkable things that stayed with me were the action scenes. 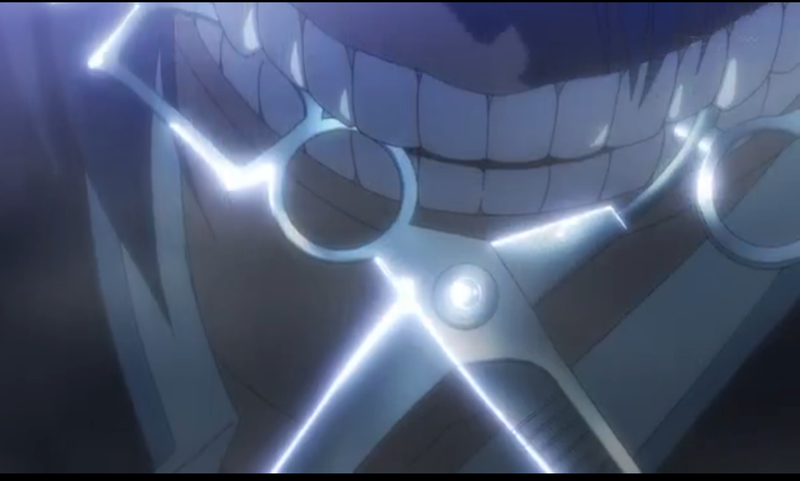 It's just really hard to think of a pair of Scissors being a particularly interesting weapon to root for in a fight, but they do make it work. -Doesn't feint on any punches. If it seems like they're going to do something shocking, they do it. -The action scenes are a good time to watch, they make a very unusual weapon candidate work well for them. -When the characters get depth added to them, it's good. You're never just expected to accept something, the character usually reacts, explains, or thinks enough about anything to feel acceptable. Cons: The characters don't develop nearly as fast as I feel they should for a 13 episode anime. -They don't pull the 'Big Reveal' about our main protagonists until the last episode, and even then they don't even close to fully explain Iwai's case. -For all its uniqueness, Dansai Bunri's final impression is forgettable. Perhaps this is because the story is obviously meant to continue past where the anime ends, but plenty of other short season anime have had that, and still been memorable. My Opinion: I think you should watch it, at least once. I greatly enjoyed Dansai Bunri 'In the moment', watching it as each episode came out, but looking back on it now after finishing it, I have a hard time remembering anything especially significant. Impartial Judgement: Don't be turned away by it's strange plot and setting alone. If by episode three you haven't seen anything at all interesting though, you're probably not going to. If you absolutely hate 'Shounen' or 'Shounen Battle' genres, this isn't going to be the radical shifter for you. If you have time to burn, this is a unique way to do it, but don't displace something else with this. If they make a second season, Dansai Bunri will probably greatly increase in value, but until then, it's almost possible to watch a few of the first episodes, and then just skip to the last 2-3.